Amazonite is a bright-green variety of the mineral microcline feldspar. Amazonite occurs in quartz-rich granitic rocks, especially coarse-grained granites called pegmatites, like the one shown here. This sample is probably from the Pikes Peak region in Colorado, where some of the highest quality specimens are found. The name “amazonite” is derived from the Amazon River because early collectors believed (erroneously) they had found amazonite there. Amazonite (10 cm maximum dimension) in pegmatite granite. Bright green = microcline; grayish and whitish (both can be somewhat transparent = quartz; white = microcline; black = biotite). The underside of this rock is cuneiform graphic granite (see previous post). This post presents an opportunity to point out the "visual clues" a geologist would use to explain how this rock formed. The rock consists of interlocking large crystals of several minerals. The interlocking of the crystals indicates that they formed from magma (molten material), and the large size of the crystals means that they cooled very slowly. The rock, therefore, is a plutonic igneous rock that cooled very slowly underground. The word "plutonic" is derived from the name of the Roman god, Pluto, who lived underground. The presence of quartz means the rock formed late in the fractional crystallization sequence. As the magma cooled, a certain sequence of minerals form, and the chemistry of the remaining melt changes. This sequence is elegantly summarized by what is known as the Bowen Reaction Series (see diagram at the end of this post). The presence of lamellae of different colors (green and white) in the overall bright green crystals means that there was exsolution of two minerals: white is albite, and green is microcline. These two minerals crystallized together when the remaining magma melt was rich in potassium, with a lesser amount of sodium. These lamellae form what is known as perthitic texture, which is common to the alkali feldspars (late-forming minerals rich in potassium). Amazonite (3.8 cm thick), showing exsolution lamellae of albite (white color). The bright green color of amazonite was a mystery to science until detailed studies showed that its color is a result of natural radiation of microcline containing a relatively high level of lead and water in the crystalline structure. This poster depicts a poster I made that shows the progressive sequence of fractional crystallization of the Bowen's Reaction Series. It was not made with the intention of showing it online. This explains why the the writing on the poster is somewhat hard to read. 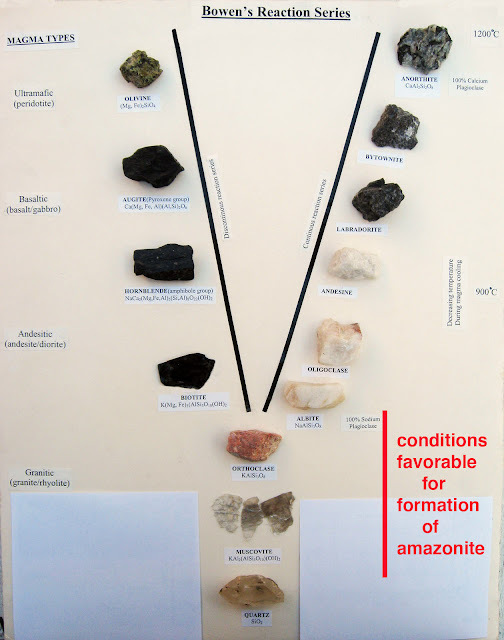 Although the dark minerals do not show up well, the poster conveys the concept of the sequence of minerals that form in an ideal (in a chemical composition sense) magma as it cools.